Gulf Craft has launched its new triple deck Majesty 125. After successful completion of sea trials and commissioning, the new model will make its global debut at the Cannes International Boat and Yacht Show (Berth SYE114) in September before heading to the Monaco Yacht Show (Berth T43, T Central Dock) and the Genoa Boat Show. The Majesty 125 has been designed with exquisite performance, luxury and comfort in mind. The superyacht comes with 5 en-suite state rooms that emphasize panoramic views, an owner’s room that is full beam with walk-in closet, Jacuzzi and en-suite office. Accommodation for 7 crew, and a garage for 2 jet-skis and a dinghy. Outdoor spaces are emphasized on 3 of its 4 decks, with plenty of lounging and entertainment areas fore and aft of the yacht, including automatic retractable sunshade and Al Fresco dining. A 6 person Jacuzzi on the sundeck offers 360 degree views and 2 sets of outdoor wet bars with barbecues ensure capacity always meets demand. This ocean-going vessel Majesty 125 is created with careful selection of fine leathers, woods, and marbles to breathe luxury throughout its exclusive interior design. Its luxury is captured in the variety of unique masonry used throughout; white and yellow Onyx marble, Navona Travertine, Crema Marfil, Shivakashi Granite Black, Absolute Granite, and Black Portoro are used in full panelling, as well as for inlays and margins. All carpets inside the Majesty 125 yacht are quality hand tufted from 100% Japanese acrylic yarns with sound proofing double underlay, which are complimented by suspended and sound-dampened ceilings. Attracting admiration across its 3 closed and 1 open deck, with striking “hawkbill” profile and distinguished exterior styling, the motor yacht Majesty 125 is the most technologically advanced yacht built at Gulf Craft’s state-of-the-art manufacturing facility. Equipped with a set of 2,400 HP MTU engines, zero-speed fin stabilizer system, and redundancy on major on-board systems, the Gulf Craft Majesty 125 super yacht also features custom-developed software integration for its alarm and control systems alongside a dedicated power management system and bespoke audio-visual management system throughout the vessel. The yacht was the first of its size to be constructed using the latest FRP vacuum infusion techniques, reducing weight while improving strength. Gulf Craft has developed a track record of building under Lloyds and other supervision, including MCA, DNV, and several charter specifications from the US to Europe and Australia. 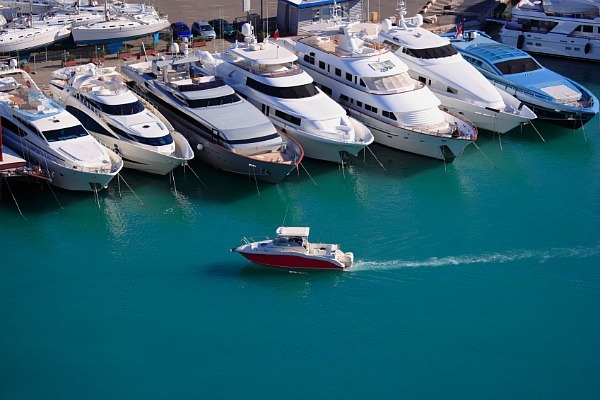 The ability to adapt to numerous standards and classes whilst giving owners the flexibility to customize their luxury yachts without the price premium distinguishes Majesty Yachts.